I had hoped to go under 2:40 in this race, but the gods were not on my side this time. My friend Brendan Lunty had the perfect day, and won in 2:33. Amazing well done! This guy is just a marathon machine. Mike Booth was second in 2:36. I was in third spot for a while myself, but David Corbett passed me and got third spot, just under 2:41. You can view complete Edmonton Marathon 2010 results here. 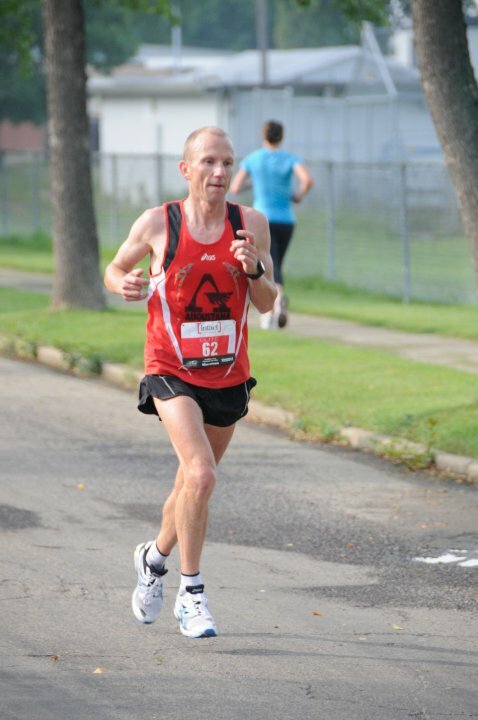 The Edmonton Marathon course is really great. I have to say it’s one of the faster marathon courses I have ever run. If you are looking for a quick course in Canada in August, this is the race to go to. This how I looked at 37.5 km - way more tired than I looked! As for my race, it started out good and I ran together with another guy for most of the first half. We were in 4th/5th position, and we passed 5 km in 18:45, 10 km in 37:20 and then at 21 km, I had 1:18:10. At that point, I felt quite good but I noticed signs that my legs were getting a bit tired. I slowed down a bit, thinking that even with a 1:22 second half, I will get around 2:40. The other guy I ran with dropped back at about 23 km or so. I noticed I was gaining on Corbett and by 31 – 32 km somewhere, I passed him. I still felt confident. I was running around 4:00/km and I remember doing the math – if I keep this pace all the way in from 30 km, I will get 2:39. Same at 32 and 34 km, I was still on pace for 2:40. At 36-37 km, there was a hill. Not insanely hard, but long and steep enough that I had to really slow down. I was being careful so that I didn’t red-line. At the top of the hill, with 4-5 km left, I tried to pick up the pace again. Uh-oh, bad news buddy. The tank was now empty. DARN IT! I knew it was game over. Corbett came back at 39 km or so and I was barely moving. There went 4th place. I was hoping I could gain some energy back if I took it really easy for a few minutes, but not a chance. At 41 km, I figured I should be able to work hard over that last one kilometre, but then Jack passed me at what seemed a blazing speed. I tried all I could to go with him, but couldn’t even do it over 20 meters. There was nothing I could do about the empty tank – I could only jog slowly towards the finish, and I ended up with 2:44:51 and 5th place. Not bad overall, but not what I had in mind this day. I felt very tired at the end, and also very hungry. I ate an armfull of bagels and fell asleep in my car – I was completely exhausted. This has made me think – perhaps I should have a bigger breakfast. I ate a large dinner the day before, but for next marathon, I am going to try a different approach: get up earlier, eat a larger, more complex breakfast 3-4 hours before the race. That might help with energy in the late stage of the marathon. As for the next marathon, I am not sure, but I am hoping it may be the marathon in Sacramenton in December. My goal is to increase my mileage a bit now, to get tougher legs for finishing the marathon strong. I always fade way too much at the end of marathons, so higher mileage is likely what I need. Next on my schedule is some shorter road races and then cross country. I will be going to Guelph, Ontario in November, to run the National Championships with a group of runners from the Edmonton area. I am really looking forward to this!